Come spend Christmas in Dublin this Christmas! 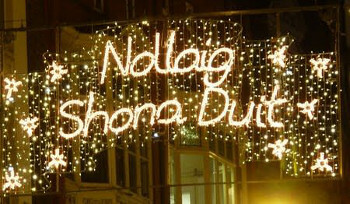 ‘Nollaig Shona Duit’ ‘Nollaig Shona Duit’ is the Irish term for Happy Christmas and with so much going on in our capital during this festive period, Dublin is where it’s all happening. From the streetlights, the window displays, all the way to craft fairs, the Dublin Food & Wine Magazine Christmas show, it has everything to offer everyone from home and abroad. DPNlive will keep you updated with all the major events planned for the run up to Christmas each week, so make sure you check our listings out. Would you like to get your little ones into the swing of Christmas! Well you can with ‘Draíocht’s Tiny Tots Christmas Elf Art Experience’. It takes place every Thursday for five weeks (6th November - 4th December), and artist Orla Kelly’s carefully created, exciting series of weekly workshops has been designed to encourage parents and children to have fun while learning through the arts. The sessions are based around the show Elf Factory, which parents and children will attend at the workshops. These use themes from the show, and Kelly’s sessions explore a variety of creative and playful elements that include storytelling, movement, painting, building, creative investigation, music making, exploration of colours and shapes, drawing and so much more. The sessions are suitable for children aged two to four years. The market comprises of more than 60 trade concessions located in traditional wooden chalets along the exterior of St Stephen’s Green Park between Grafton Street and Merrion Row. It offers a unique selection of quality Irish made handcrafted gift items, including accessories, woodcrafts, jams, preserves and prints, as well as seasonal food and drinks to include charcoal grills, crepes, bratwurst, chocolate fountain, gluhwein, and other seasonal non-alcoholic drinks. Traditional Christmas Markets have their origins in central Europe, and are extremely popular in countries such as Austria, Germany, Northern Italy and France. They have proven to be extremely successful in attracting additional people into town centres and encouraging consumers to spend their money locally as opposed to shopping online. The organisers have even laid on entertainment in the form of local choirs and carollers to also help get visitors into the festive spirit. The market is be free to the public and is open daily from 12 noon to 8pm. It’s being billed as a ‘three-day food and drink extravaganza’, that will show you how to recreate world class dishes in the comfort of your own home! For those three days of that weekend, the RDS Main Hall in Ballsbridge, Dublin 4 will be transformed into a winter wonderland. And Santa will be there as the guest of honour with gifts for all! At the heart of the show will be the Chef’s Kitchen featuring Ireland’s top chefs. The idea is to learn from the masters and recreate some of their favourite Christmas dishes at home with fabulous produce available in the Artisan Village. There will also be a ‘Drinks Zone’ , ideal for wine enthusiasts and experts who want to learn more about wine matches, tasting, grape varietals and even how to pull a cork with flair! The organizers want you to ‘cosy up and discover the wonder in all things snowy’ at these shows. A rolling snowball of four superb musicians and some light fingered animation will explore the magic and mystery of all things snowy. You can look back on your favourite memories of winter and create some new ones to; this specially commissioned show is bound to capture everyone’s imagination. This brand new festive music show by composer Brian Irvine features a dynamic blend of original music, improvisation and audience interaction and will begin to bring the festive season by allowing you to share the festive spirit. Designer Gráinne Lyons wants to help you develop your creative skills and get festive at the same time with a Christmas craft workshop the National Museum of Ireland Decorative Arts and History. The workshop will afford participants the opportunity to develop their design skills by creating a lampshade from concept to finish. And it will all be done through discussion, demonstration and hands-on experimentation. Attendees will gain an awareness of 3D design and the design process, while effectively honing their own creative process. Booking for this workshop is essential, cost of admission goes towards necessary materials and it’s suitable for adults only. If you have an event planned between now and Christmas, please let me know and we will include it in out listing.